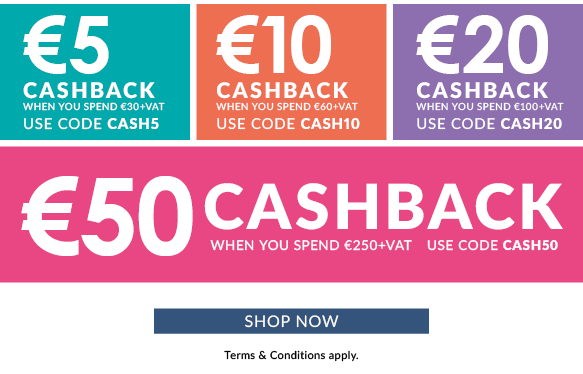 From Tuesday 6th to Monday 12th June, we are rewarding our lovely customers with cashback discount codes when they shop with us! TERMS & CONDITIONS: This offer cannot be used in conjunction with Privilege Points, 4+1 promotions, VAT Free offers, or any other offers. Enter the code before the checkout to redeem the offer. Please ensure you have entered any promotional codes before checking out, as discounts cannot be applied retrospectively to an order. Salon Furniture & Equipment, Training Courses, College Kits and Shipping are excluded from the offer. If your bill comes to €30 or more not including VAT then you will be given €5 discount on that transaction. If your bill comes to €60 or more not including VAT then you will be given €10 discount on that transaction. If your bill comes to €100 or more not including VAT then you will be given €20 discount on that transaction. If your bill comes to €250 or more not including VAT then you will be given €50 discount on that transaction. Only one discount to be given per transaction. Offer valid from 06/06/17 – 12/06/17. Online transactions may be subject to a delivery charge. This promotion is not available in M&S stores.